Chronic Lymphocytic Leukemia, is based on our selection of key abstracts from the ASH meeting in December 2006 and related publications in the following areas of chronic lymphocytic leukemia (CLL): new advances in prognosis, approaches to frontline therapy including the use of chemoimmunotherapies, management of the relapsed refractory patient, and, finally, novel drugs for the treatment of CLL. In each area we will not only provide the key points of each work, but also discuss what the results of these advances provide in our overall counseling, evaluation, and treatment options for CLL patients. We believe that the rapidly increasing information base in CLL necessitates this review and hope that our perspective provides a sound basis for individuals involved in the care of patients with CLL. 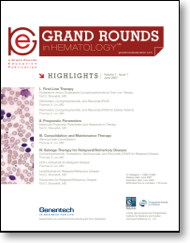 Thus this review is designed to provide a relevant body of knowledge that is both informative and practical for the hematologist/oncologist in their overall management of CLL. CLL affects more than 20,000 people in the United States and Western Europe each year. It is expected that this number will increase to more than 23,000 by the year 2010. It is currently believed that the disease results from a yet to be described critical genetic change in the B-cell progenitors found in the bone marrow. There may be a requirement for a second “hit” such as may occur from a yet to be defined environmental exposure that finally induces the clinical disease of CLL. Prognosis continues to be based on the use of both traditional and more novel investigational risk parameters that include the measurement of CD38, ZAP-70 , fluorescent in situ hybridization (FISH) defects, and immunoglobulin heavy chain variable region (IgVH) mutational status. At the time of this report, however, the exact contributions and merits of these prognostic variables are still being evaluated for time to treatment, response to therapy, and prediction of response duration. Long-term survival has not changed over the past several decades, and though there are dramatic increases in the induction of overall responses for previously untreated patients to greater than 90% and complete responses of 40% to 70%, there is as yet no curative approach. Alkylating agents and purine nucleoside analogues in combination with rituximab (so called chemoimmunotherapy) is the therapy of choice for previously untreated CLL. The failure of upfront therapy in CLL unfortunately leaves the clinician with less effective therapies in terms both of overall response and duration of that response.